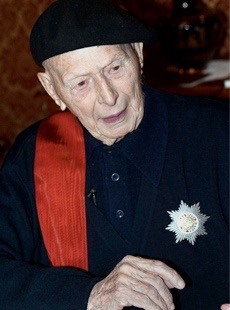 coreógrafo ruso Igor Moiséyev, creador de la danza escénica, un género nacido de la fusión del ballet clásico y los bailes tradicionales, falleció esta madrugada a los 101 años. Moiséyev, director del Conjunto Académico de Danzas Populares de la Unión Soviética y nombrado Artista del Pueblo de la Unión Soviética en 1953, nació el 21 de enero de 1906 en Kiev. En 1924 se graduó en el Instituto de Coreografía de Moscú y desde 1939 formó parte como solista de la compañía del teatro Bolshói. En 1937, durante el gobierno de Yosif Stalin, fundó el Conjunto Académico de Danzas Populares de la Unión Soviética, conocido como el 'Ballet Moiséyev', y fue uno de los máximos representantes de la danza escénica popular soviética. Durante los tiempos de la 'guerra fría', el conjunto de Moiséyev fue uno de los pocos grupos artísticos de la Unión Soviética para los que no existía el 'telón de acero'. El presidente ruso, Vladímir Putin, expresó hoy sus condolencias a los familiares y amigos del coreógrafo. El servicio de prensa del Kremlin elogió el talento del genial coreógrafo, quien fue capaz de llevar a la perfección la danza popular y ponerla al mismo nivel que el ballet clásico. Moiséyev creó un ciclo de coreografías temáticas, entre las que destacan 'Jota Aragonesa', '¡Viva Cuba! ', 'Estampas del pasado', 'Estampas soviéticas', 'Por los países del mundo', 'Partisanos' y 'Recluta'. Para el creador ruso, la danza escénica no era más que 'el paso de la danza popular que bailan los aficionados a una danza profesional que se ofrece al público'. En 1953 recibió la distinción de Artista del Pueblo de la Unión Soviética y en tres ocasiones -en 1942, 1947 y 1952- fue condecorado con el Premio Estatal de la Unión Soviética. En 1997 recibió la Encomienda de la Orden por el Mérito Civil, de España, que le fue entregada en Moscú en nombre del rey Juan Carlos I durante los festejos del 60 aniversario de su compañía de danza. Igor Moiseyev, coreógrafo ruso, en una fotografía de archivo de enero de 2006, cuando cumplió los 100 años. El funeral tendrá lugar el próximo miércoles 7 de noviembre en la Sala Chaikovski de la capital rusa, informó la administración del 'Ballet Moiséyev', según la agencia Interfax. Igor Moiseyev was a dancer with the Bolshoi Ballet when he decided to become Russia's answer to Cecil Sharp. Travelling on foot or horseback, he trekked the Caucasus and the Urals researching local dances that would become the repertory for his own folk dance ensemble. That was in 1937. Now, at 96, Moiseyev is not only older than the Russian revolution but is still artistic director of his company, which is back in Britain after an absence of 38 years. All the works in its current repertory have been choreographed by Moiseyev himself, and it is, admittedly, hard to imagine them being performed in any village square. His cast of energetic dancers are evidently ballet trained, with their feet pointed, their limbs stretched and burnished. And there are hefty shots of Soviet classicism beefing up the movement, influencing the broad acting style of the narrative dances and the mass ensemble pieces that often have up to 50 dancers on stage. This is a company that lives up to its hype as a national treasure, potently demonstrating the Russian genius for dance. The sheer range of folk styles and the delirious flamboyance of the vocabulary are astounding. From the tiny, drilled stepping sequences that make the dancers look as if they were gliding on wheels to the giant Cossack-style kicks, wheeling jumps and proudly clicking heels, this is a folk tradition that aims far higher than a couple of mild circle dances and a merry jig. Russians dance with their whole bodies: arching their backs, slanting their shoulders, stamping their feet. They are boisterously energetic and delicately sensuous. Moiseyev is also no slouch as a choreographer. He whisks his dancers through a fierce array of patterns that flood the stage with energy, as in the suite of naval dances (made during the second world war) that bind 28 sailors into a huge, bicep-pumping collectivist machine. The show strikes one slightly false note by including several of Moiseyev's picture-postcard dances - numbers choreographed in Egyptian, Greek or Spanish style that he picked up while his company was touring abroad. But the huge Russian crowd at the opening gala loved it all. This company ought to be on the agenda of any British follower of Russian ballet. Moiseyev's troupe boasts dancers to challenge the Bolshoi and the Kirov, as well as a repertory that is pure fun. · Until tomorrow. Box office: 0870 606 3400.